With Spring attempting to break through I’ve made the decision to not let the weather curb my grilling and with warm weather and grilling comes cravings for fresh produce and cold beer in my fridge. I was successful in making my first fresh salsa as well as guacamole this week and I wanted to try my hand at grilled chicken fajitas despite a rainy day in Winnipeg. A recent line of marinades I’ve discovered at my local Sobeys is from Sauza Tequila. We’d tried one with beef before but I was intrigued to give their Tequila Sunrise a try on chicken breast. I put about 3/4 of the bottle in a freezer bag with 5 chicken breasts and placed them in the fridge. I left the chicken in the marinade for 2.5 hours taking it out every 30 minutes or so to mix the contents up and try to get great coverage on my chicken. When it comes to beer I enjoy many different ones. I’m a mood beer drinker and as such I am a huge fan of the Rickard’s Taster Pack because each beer is truly distinctive in their flavour. This fact was key in my decision to pull out a bottle of Rickard’s White to warm on the counter for use in my meal that evening. I went with Rickard’s White because I felt the orange and coriander notes would enhance and pair well with the orange, lemon and lime citrus flavours of the Sauza marinade,as well as the cilantro in both the salsa and guacamole I’d made, and Kevin was positive about the pairing when I ran it by him. He’s my experimentation touch stone. If he thinks the flavour profile doesn’t blend he’s pretty upfront before I begin. The Daring Duo – Sauza Tequlia Sunrise Marinade and Rickard’s White. Kevin also taught me that it is ideal to use room temperature beer when you cook with it so I had the bottle warming up on the counter top for 2 hours before I used it. 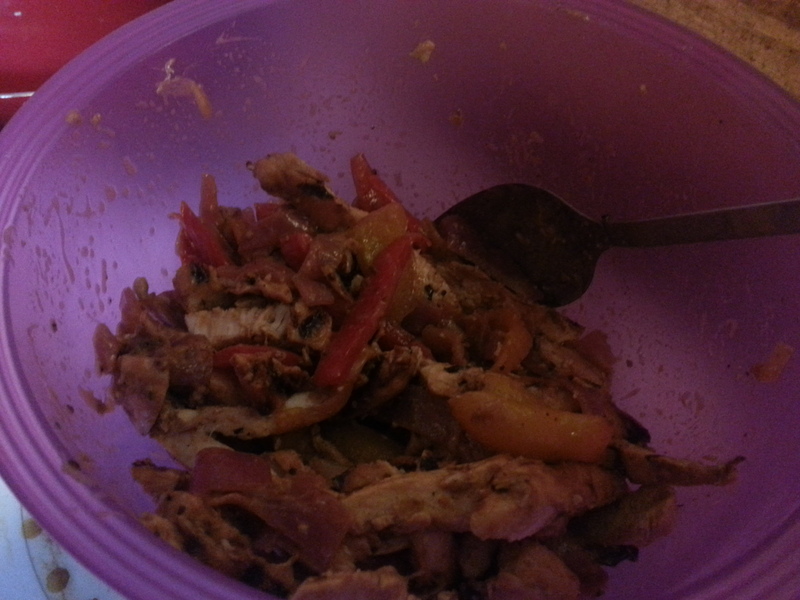 To go with my grilled chicken breast I cut up one purple onion and two bell peppers. 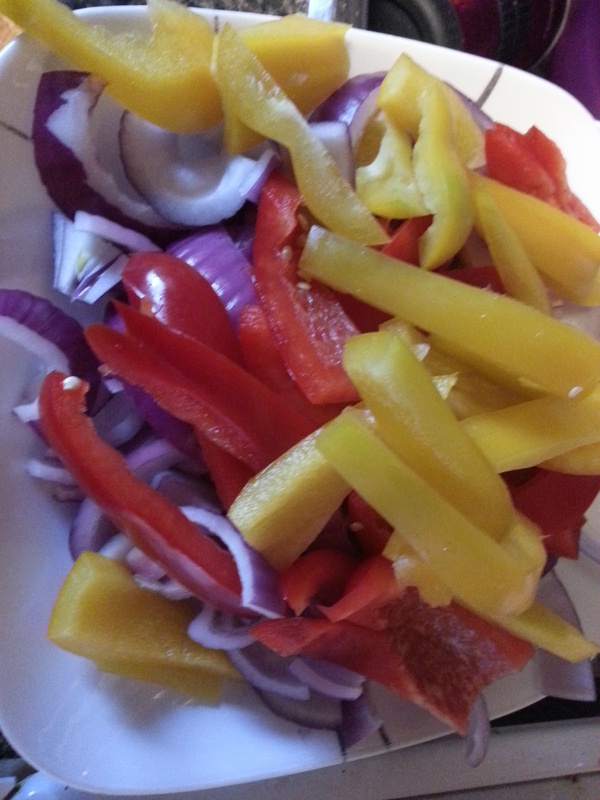 One purple onion, one yellow pepper and one red pepper. Chopped and ready to go. I tossed them in the remaining 1/4 bottle of the Sauza Marinade before placing them in warmed frying pan with 2 tablespoons of heated grape seed oil on medium low (between 3 and 4) heat and left them to soften. When the onions began to become translucent I turned the heat down to low and let them continue to caramelize. Onions and peppers – caramelized and ready for their Rickard’s finish. The marinade coated the onions and peppers nicely and as they caramelized in the frying pan the sauce nicely thickened so they were coated in a flavourful sauce, similar in thickness to the packaged sauces you can pick up at a grocery store. 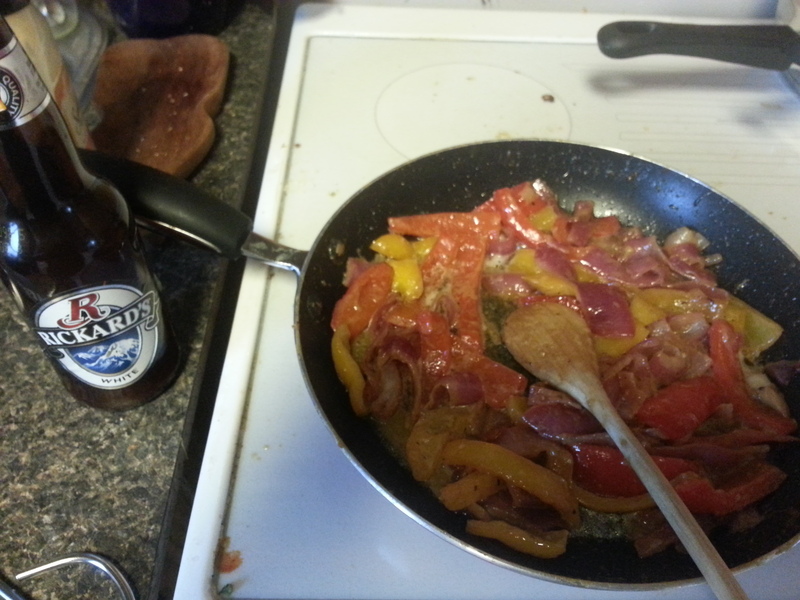 When the onions reached the glassy state I took the bottle of Rickard’s White and did a turn and a half around the pan and stirred my veggies around so they got covered in the beer and then let it continue to simmer over low heat. With my onions and peppers taking care of themselves I turn my attention to the chicken. I heated my grill up for 20 minutes as it was raining and this can affect the overall temperature. I place my chicken on the grill and set the timer for 20 minutes and when the timer went off I flipped the chicken and was delighted at the nice grill marks. Another 20 minutes and I put the chicken on a plate to rest for 5 minutes. While the chicken rested I removed my onions and peppers from the frying pan and kept it on the heat to keep warm. After the 5 minute rest I sliced the chicken into strips and placed them into the pan my onions and peppers had just been removed from. I poured approx 1/4 cup of the Rickard’s into the pan and let it fry off while tossing the chicken strips. Finished meal ready for the table. After the Rickard’s had cooked off I combined the chicken strips with my onions and peppers and served with fresh guacamole and salsa on tortillas. My dad, who had dropped in, was invited for dinner and he had high praise for how great the chicken turned out. I have to agree that it was juicy and flavourful. 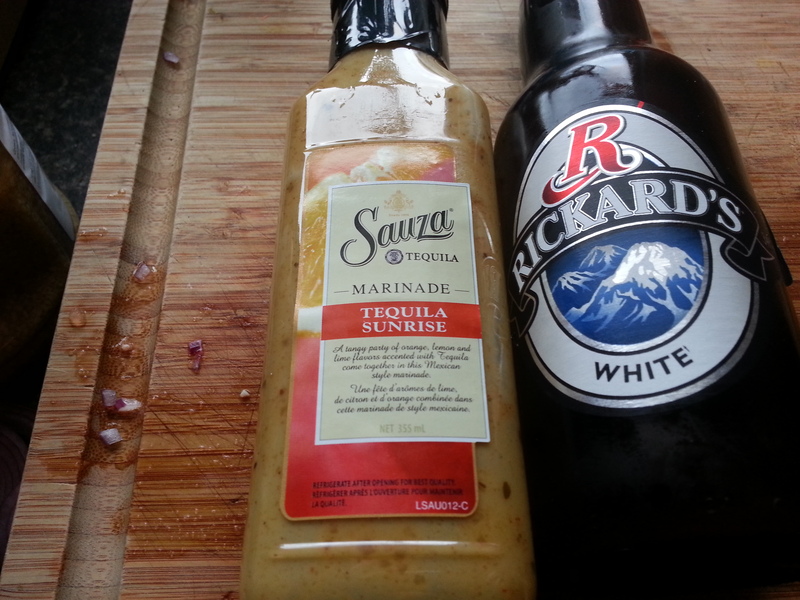 The Rickard’s added a nice depth to the marinade from Sauza. Not bad for a moment of I think this will work…. 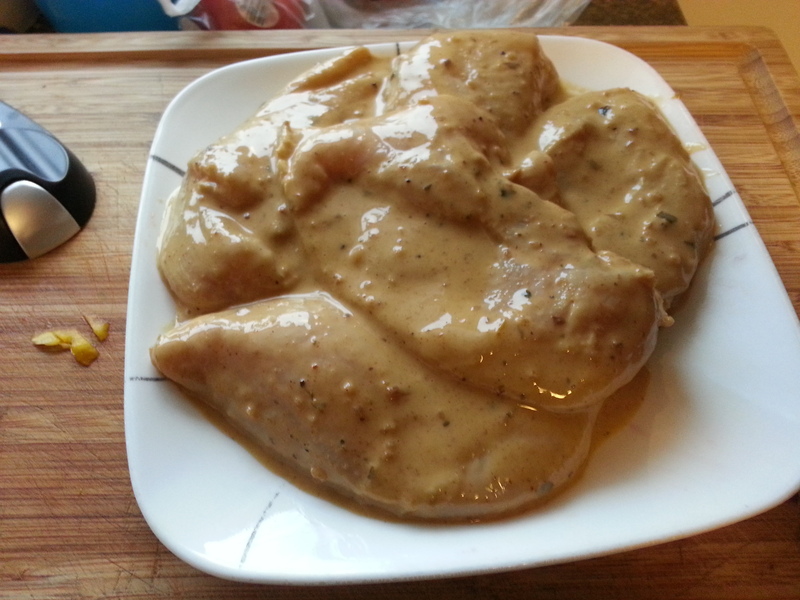 Posted on May 1, 2013 by Shirley Robert	• This entry was posted in Recipes, Social Eating and tagged chicken breasts, fajitas, grilled, grilled chicken fajitas, Rickard's Beer, Rickard's White, Sauza, Sauza marinade, Sauza Tequila. Bookmark the permalink. Our concept is already live in 30 countries, for example: US, Mexico, UK, France and Spain amongst others. We deliver thousands of visitors to food blogs daily. Some of the top food blogs receive 10,000+ visitors from us on a weekly basis.